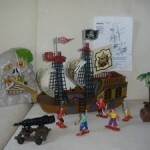 Exceptional opportunity on a large batch of toys and brands SMOBY BERCHET . All toys are brand new . And a second lot of educational games and books from a toy library. The items are first choice but not new. (Puzzles, puzzle games, board games). Public price means games = 25 to 30 €. for only 17 pallets € 4,500 HT outputs warehouse . Possibility of organizing delivery trailer and shipping container for import-export.